Everyone knows what mutation is, right? It’s that magical scientific hand-wave that gives the X-Men their powers. Almost certainly the result of interaction with gamma radiation or toxic substances, mutation always has the most drastic results on the people that it affects. Right? Unfortunately for us would-be superheroes, these results are neither likely nor commonplace, and the effects of mutation are almost always exaggerated while its everyday occurrence is typically ignored. The best example of how mutation affects our everyday life is, ironically enough, found in a brief scene from X-Men: First Class. The young Professor Xavier mentions while wooing a young woman that based on her blue eyes alone she is a mutant, as blue eyes are a result of a specific mutation to DNA. This observation is as close to science fact that the movie comes. The word mutation comes from the Latin “mutare” which means “to change.”  Thus, by its roots the word mutation indicates a change or modification to something. In the context of biology, this is specifically a change to the genetic structure of an organism, to the organism’s DNA. Within that broad definition fall many forms of mutations, each with varying results and effects. An overarching classification for mutations is the scale at which they operate. Small scale mutations affect only a single gene, or perhaps only a few DNA base pairs, whereas large scale mutations affect an entire chromosome or chromosomes. Large scale mutations can be similarly subdivided. Duplications and deletions occur when regions of the genome are repeated or removed, respectively, from a chromosome. These types of mutations can cause a certain protein to be overproduced or not produced at all. Underproduction of a protein might result in toxic waste buildup that the cell cannot clean up, while overproduction might result in the cell transporting away all of its raw materials; neither is beneficial to cell behavior. A visualization of these mutations can be found in figure 2. 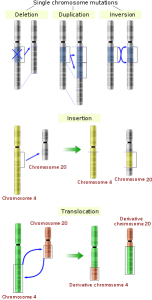 Translocation occurs when portions of the genome move from one location to another. This can happen between different locations on the same chromosome, or when a gene moves from one chromosome to an entirely new chromosome. The demonstration of movement to another chromosome can be seen in figure 2. Inversion results when direction of a region of the genome is reversed, making it effectively unusable. Just as long passages of text are difficult to read backwards, inverted genes can no longer be read and used to produce proteins. On the extreme end of this classification is the addition or removal of entire chromosomes, known as aneuploidy. A good example of this is the replication of the 21st chromosome that leads to Down Syndrome. Further classification of mutations is possible, such as the effect on the organism, or alternatively the effect on cellular function. Effects on an organism can be beneficial, and aid the fitness of the organism; detrimental, and reduce the fitness or capabilities of the organism; or lethal, and kill the cell or organism. Beneficial mutations are rare; much more common are the detrimental mutations that can cause cancer. Where a mutation occurs can also affect how a mutation influences an organism. A mutation to the region of the genome that codes for a given protein will have a major impact on cell or organism behavior. Mutations in other regions of the genome may only have a more indirect impact on the organism. The most important alternative classification, however, comes in distinguishing whether or not the mutation will potentially be handed down to the organism’s offspring. If the mutation occurs in somatic or general body cells (e.g., skin cells in humans), then the effect of the mutation is limited to the original organism. However, if the mutation occurs in the genetic material that is passed on to offspring, known as the germ line (e.g., egg or sperm cells in humans), effects propagate on to new generations. These propagating changes cause populations to change and evolve. We are the result of the compounding effects of thousands of different mutations to our ancestor’s DNA, determining features from our eye color to our height to our mental capabilities. While we may not possess superpowers, we are all X-Men (or Women) in our own way. This entry was posted in Evolution 101 and tagged Biological Evolution, Evolution 101, genetics. Bookmark the permalink.